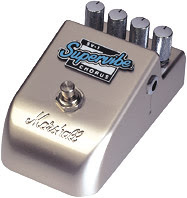 I just got one of these Marshall Supervibe Chorus pedals, from my favourite secondhand shop. I knew if I went in, there was a chance there’d be something I’d be interested in – and there was. I guess by buying this I have made the decision to go with individual pedals rather than a multi effects pedal (I had been considering a Digitech RP250). So I now have a Marshall Bluesbreaker pedal (two settings – I mainly use it purely as a boost – but the blues setting in front of my Laney VC30 is stunning! ), this Supervibe chorus (with the possibility of some rotary sounds too) and a Behringer TU100 pedal tuner. I had a Danelectro autowah which I got from the same secondhand shop (see post earlier) but that was rattling about in my bag and the control pots snapped off the circuit board – bugger! So I’ll look out for another one of those – I liked the sound it made. I also still have my Boss BE5, but the only effect from that that I still need is a compressor (I’ve just ordered a delay pedal from ebay). I also have my footswitch for my amp, which has one switch for channel changing and another for reverb. So it is time for me to sort these pedals out – there are accepted sequences for using individual stomp boxes – the order in which you place them certainly has an effect on the sound. I need get a multi-power supply to cut down on batteries and decide on a pedal board of some description – at the moment I spend too long setting up and stripping down these separate pedals. I’ll keep you posted, if you’re interested. Following Sam’s comment to my “Alley oop” post and my response to that, I took myself off to google to see what I could find. 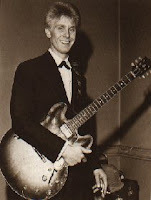 As I said in my comment, when I was a very very young wannabe guitar player, I used to wannabe Joe Brown. He played great guitar (still does), was a bonafide English rock’n’roll star and used to have a black leather guitar strap which had horse brasses on it. (Google let me down here). I don’t know why, but that seemed so cool at the time (No, don’t groan in disbelief at the cheesiness – I was young and naive – now I’m only naive!). Joe is still gigging away – the link will take you to his website. Waking up to the news that Saddam Hussein had been executed, I was reminded that I hadn’t been to Baghdad Burning for a while. There is a stunning piece of writing there that should be read by everybody, whatever their opinions on the Iraq war. We now return you to your regularly scheduled transmission. Alley Oop – The Hollywood Argyles. The Holloway Pages has a load of info and art from the original Alley Oop comic strip too – that’s where I got the image from. Words and Music by Dallas Frazier, based on the comic strip. Simultaneous competing version by Dante and the Evergreens hit only #15. He sure is hip ain’t he? Like what’s happening? This site was also very interesting – it lists cover versions of songs, tells you who did them and when. Very useful for an idiot like me who is fascinated by such stuff. “I just saw . It must have taken weeks to finalize the page. Seeing Thumbrella – Words To A Void, I’m simply full of respect. 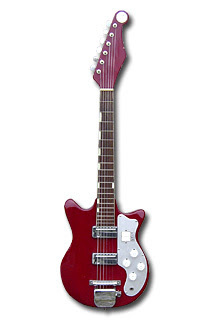 My mystery guitar, but recently identified as Teisco built and sold in the States as the Teisco MJ-2 (Starway MJ-2L), marketed by Rose Morris in the UK briefly in the mid-60s as part of their Twenty range. A rare bird indeed. 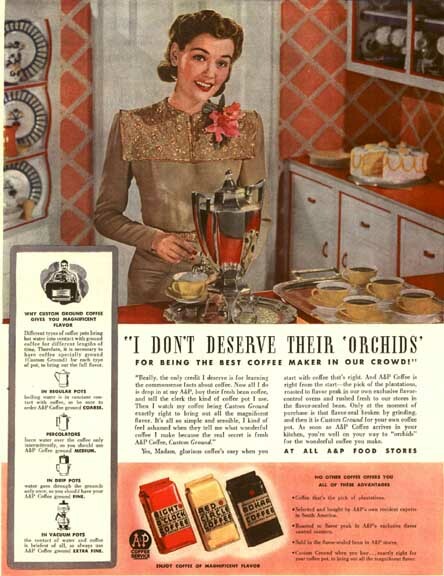 More information than you need about vintage coffee equipment and coffee making methods.